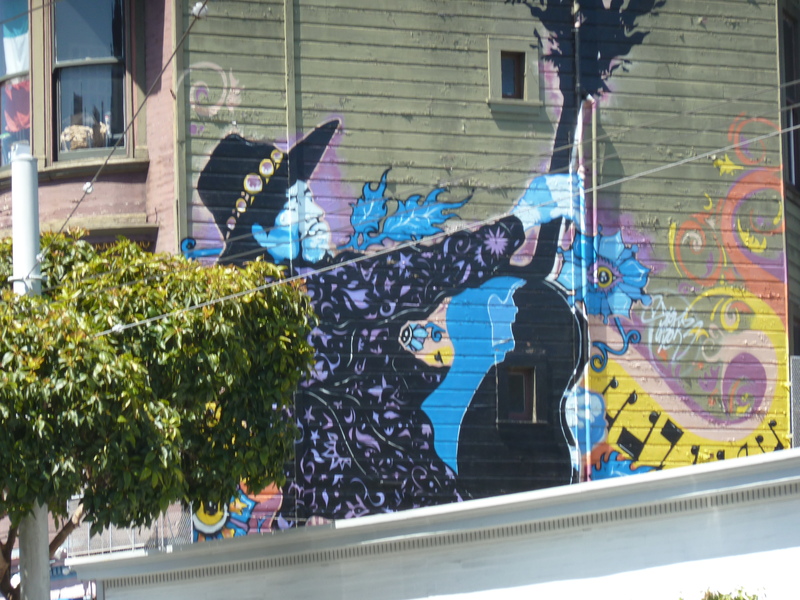 Readers of this blog will already be aware of my affection for the Haight Ashbury neighborhood of San Francisco. Several articles have been devoted to its history, architecture and culture. 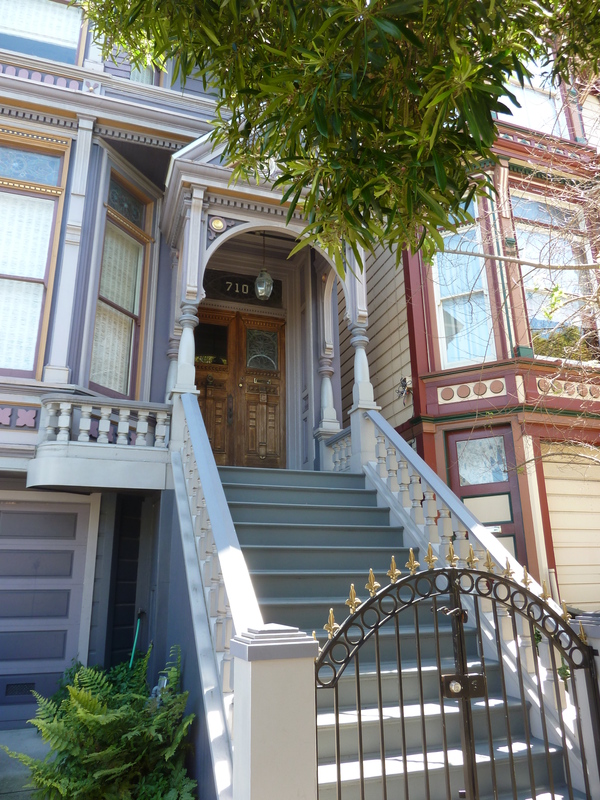 Following my recent trip I have revisited my collection of photographs of the neighborhood. It started off as just a series of images but I have found it hard to resist commenting on a number of them in passing. 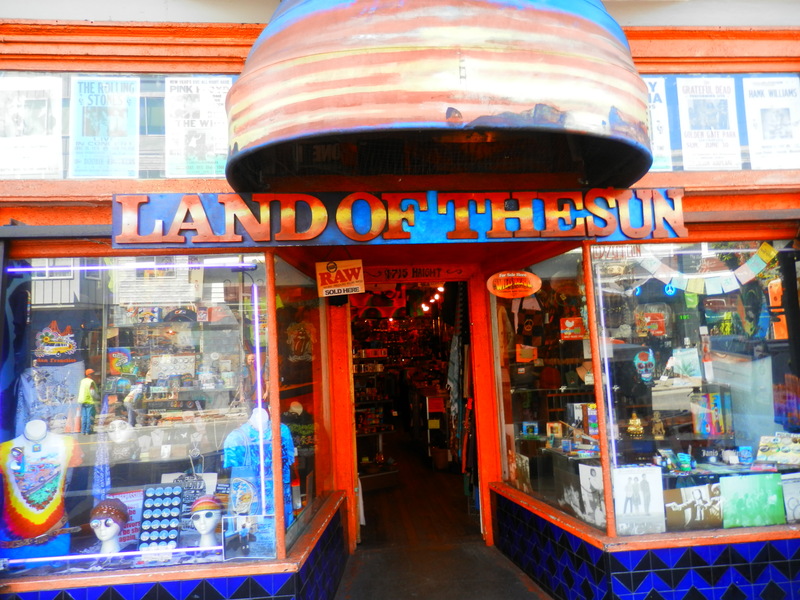 I will start with the store in which my vacation dollars and I are most easily parted – Land of the Sun, the best place on Haight Street for tie-dye shirts and hippie paraphernalia such as jewelry, beads, throws and other household accessories. 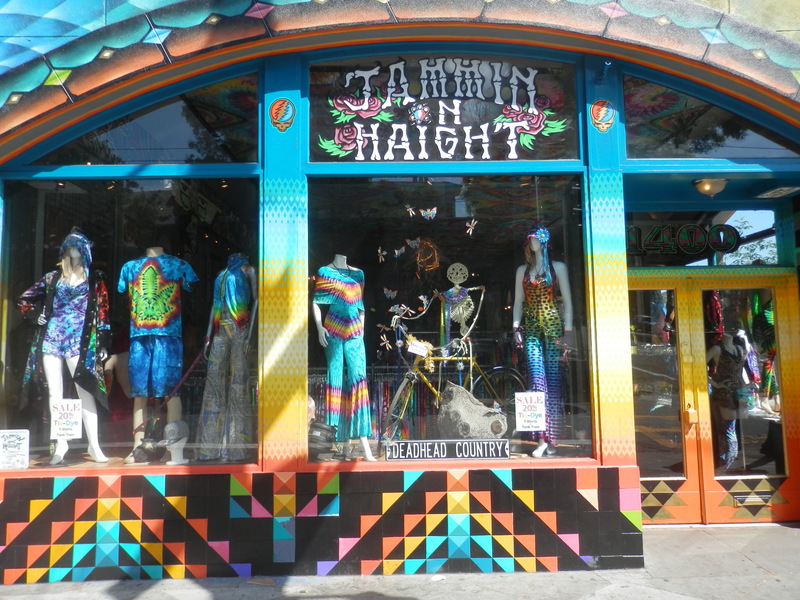 The other store in which I have often satisfied my craving for tie-dye is Haight Ashbury T-Shirts. It might not be as enticing as Land of the Sun from the outside, but it is a great place to hang out in, even if it does mean you having to spend much of your time craning your neck to view the merchandise that occupies the entire ceiling space. 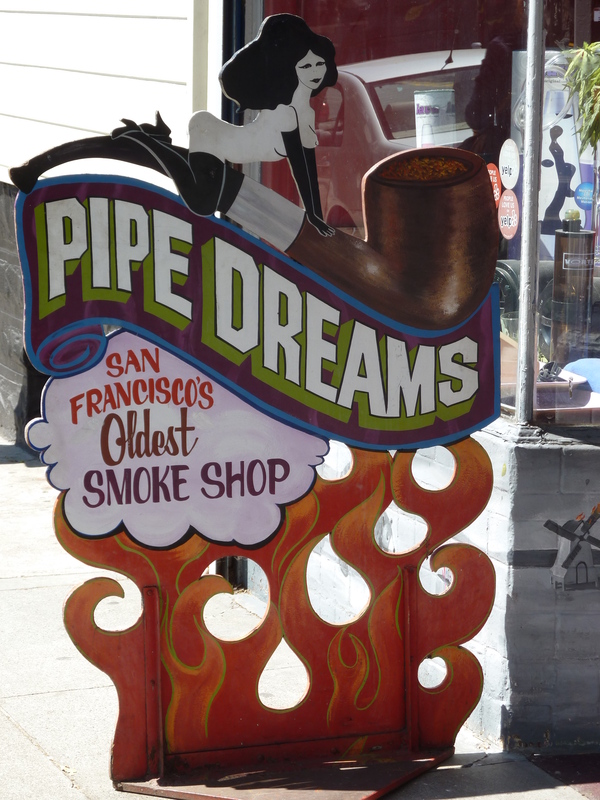 But it does have the added kudos of being sited at the iconic Haight and Ashbury intersection (though not the definitive corner – that honor now goes to Ben & Jerry’s). 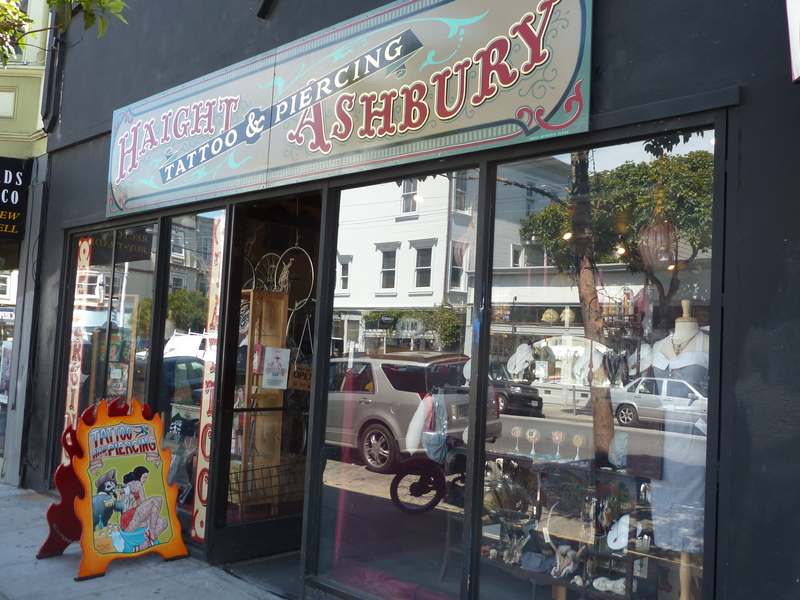 Haight-Ashbury is not just hippie clothing and smoke shops of course. It also boasts some of the finest Victorian architecture in the city, as illustrated by this fine pair of Queen Annes situated literally yards off the main drag. 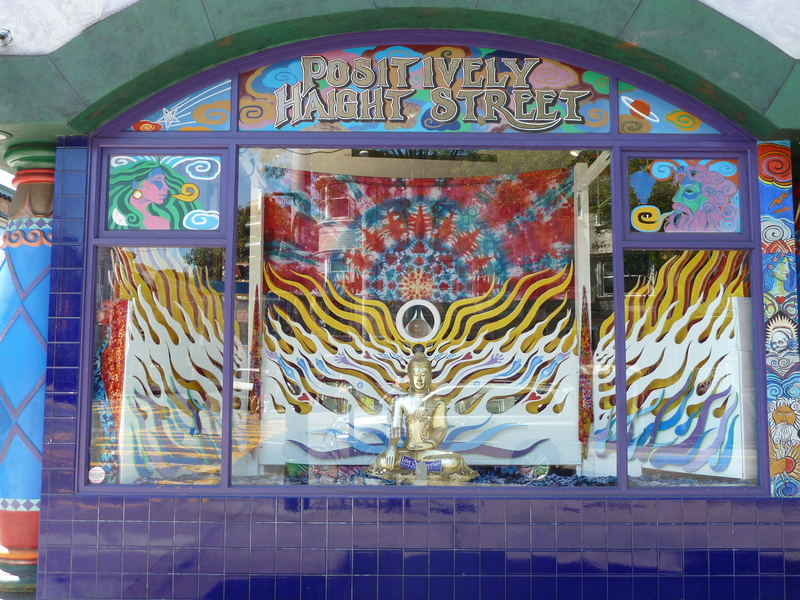 My first port of call on hitting the ‘hood was once Positively Haight Street, a wonderful hippie-oriented store with stunning facades. 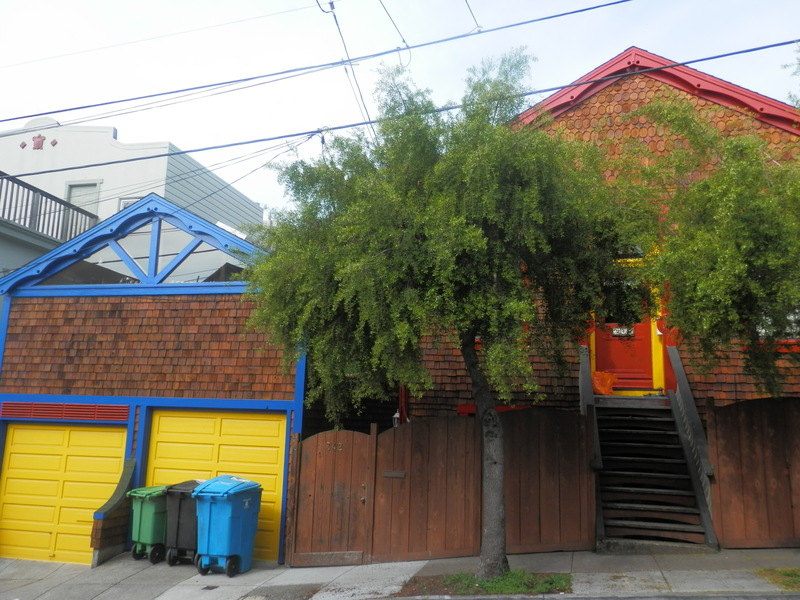 In June 2012, new owners opened Jammin on Haight on the same premises. 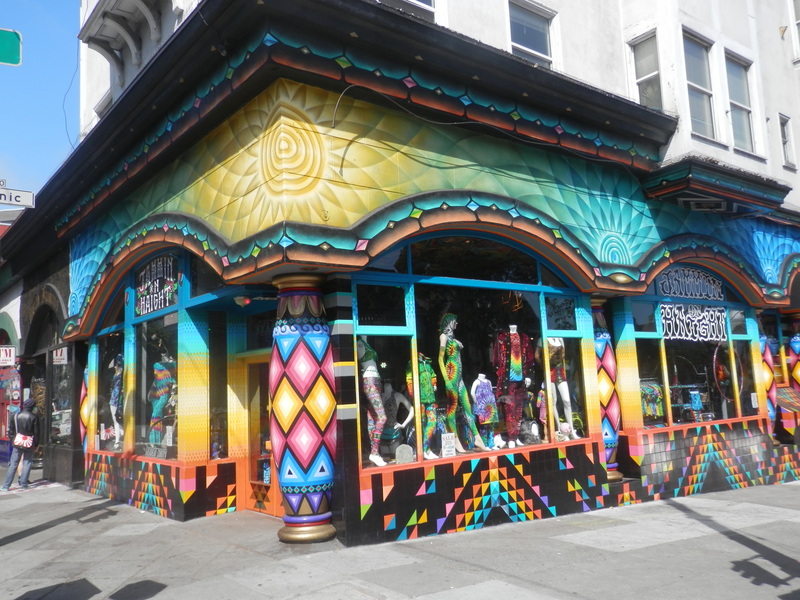 Still dedicated to tie-dye fashion, it is undeniably a beautiful store but I haven’t yet quite warmed to it. 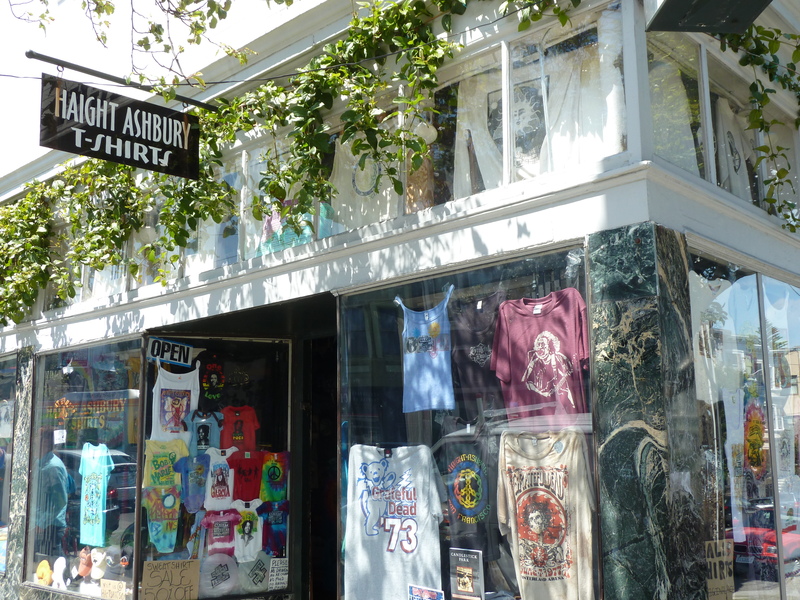 Much of the overtly Grateful Dead apparel and accessories – despite the sign in the window below – have gone (or do I have “two good eyes” but “still don’t see”? ), and it exudes a more upmarket, well scrubbed vibe that I can’t readily relate to. 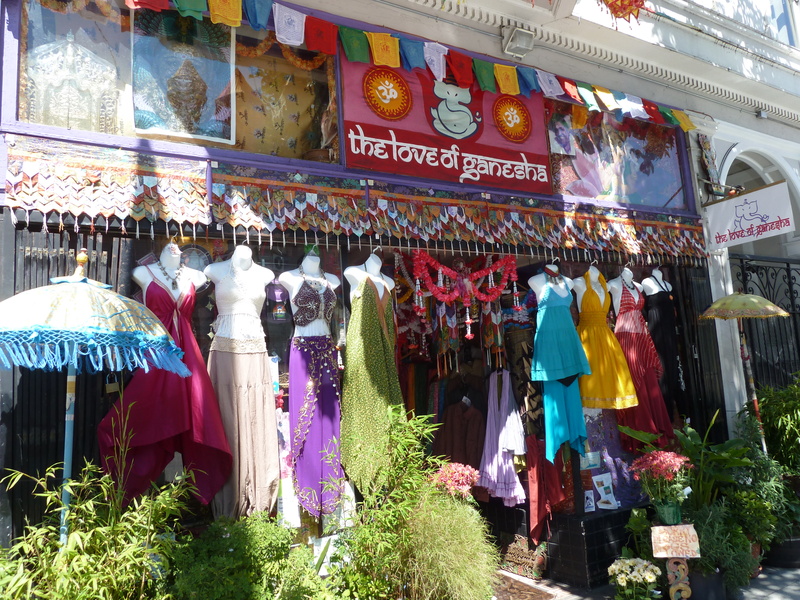 The window displays, though sporting different designs, remain beautiful. 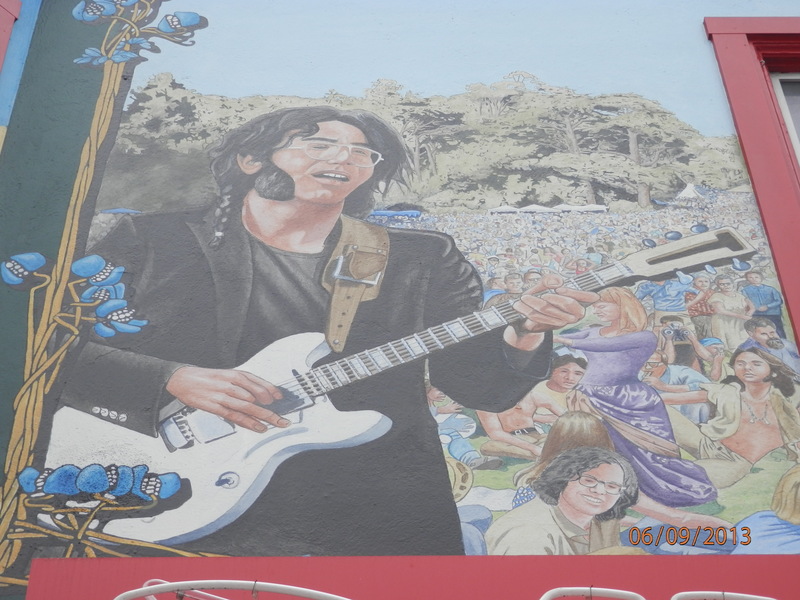 I once sang (I use the word advisedly) the Grateful Dead song, Ripple, with a young busker on that corner above. I often wonder whether he was still able to eat that evening. Though I have not had cause to visit these establishments much, here are some more colorful shopfronts. 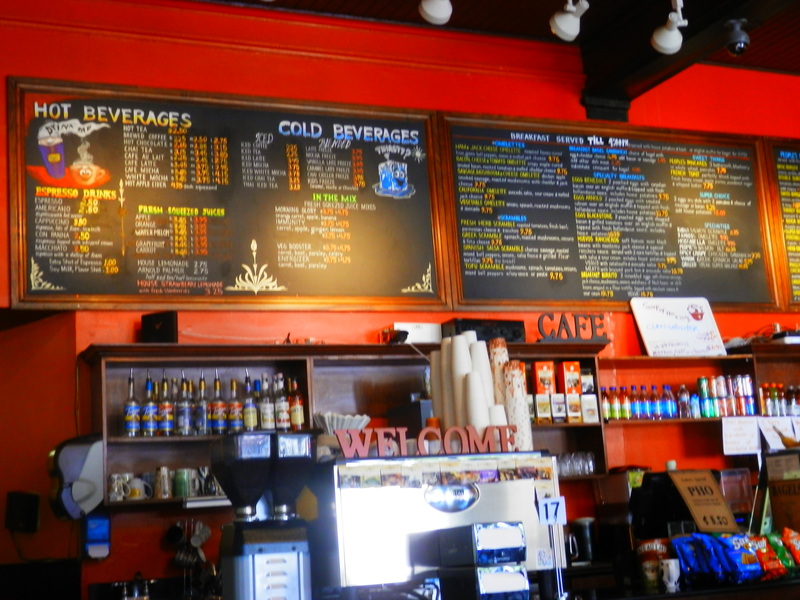 Although I’ve still not managed to beat the lines at the legendary Pork Store Café, the following have provided hearty sustenance over the years. 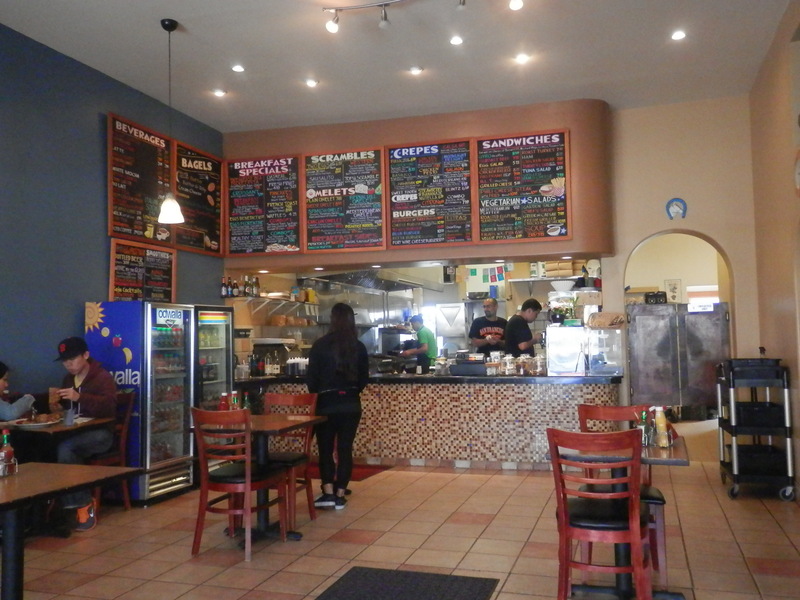 And we will get to eat at Cha Cha Cha one day too! Familiar and long gone (but not forgotten) look out on you every few yards along Haight Street. 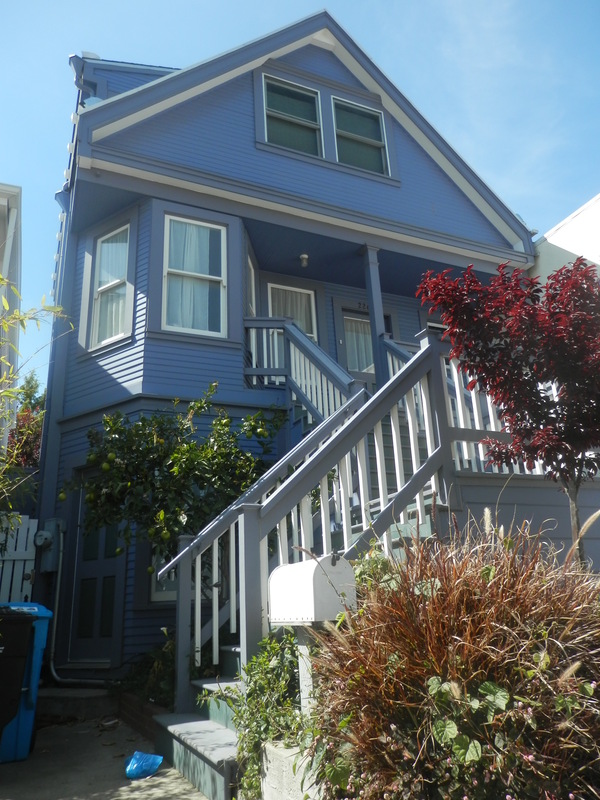 No photo gallery of the Haight would be complete without a full frontal view of 710 Ashbury, the Grateful Dead’s home between 1966 and 1968. 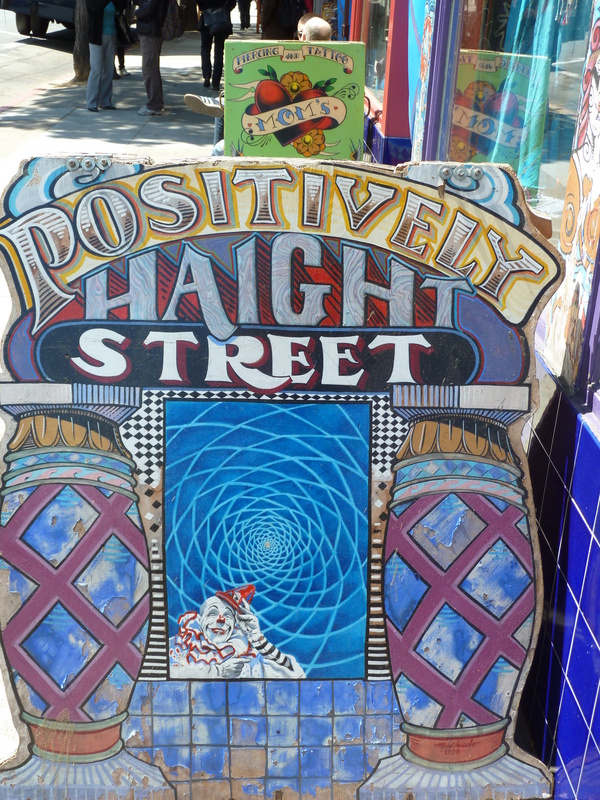 Back to Positively Haight Street, once the retail king of the neighborhood for an unreconstituted Deadhead. 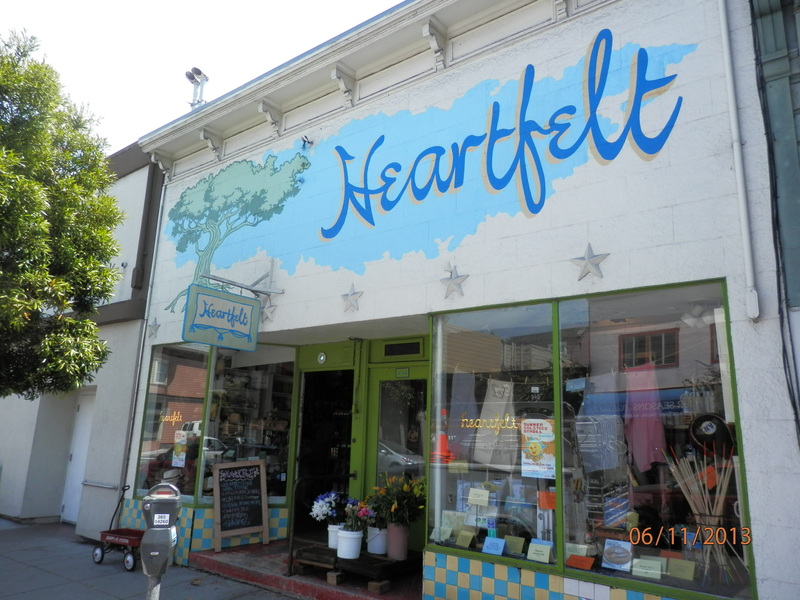 With every visit to San Francisco I learn of the demise of more quality neighborhood bookstores. 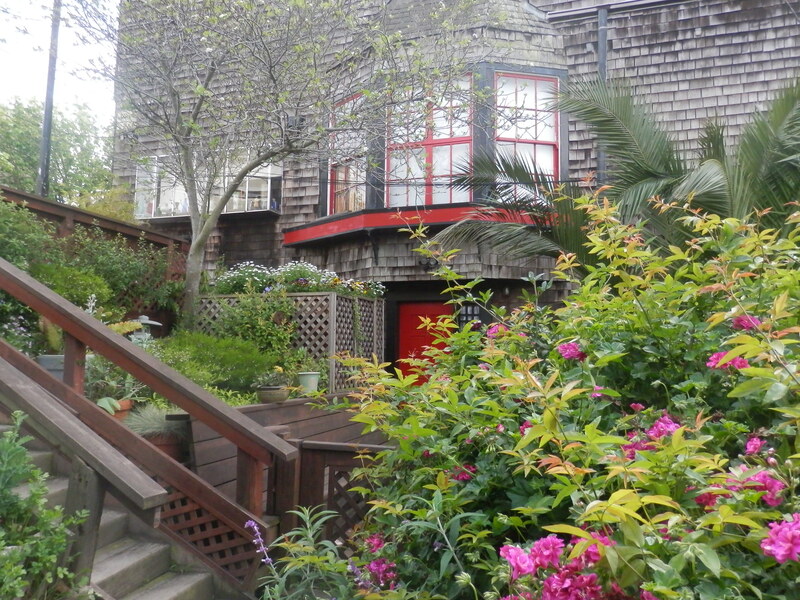 Even since my last trip less than a year ago, Badger Books in Bernal Heights and Phoenix Books in Noe Valley, the latter replaced by an inferior alternative, have closed. I was shocked also to find that Aardvaark Books on Church and Market had been remodeled as a secondhand store. 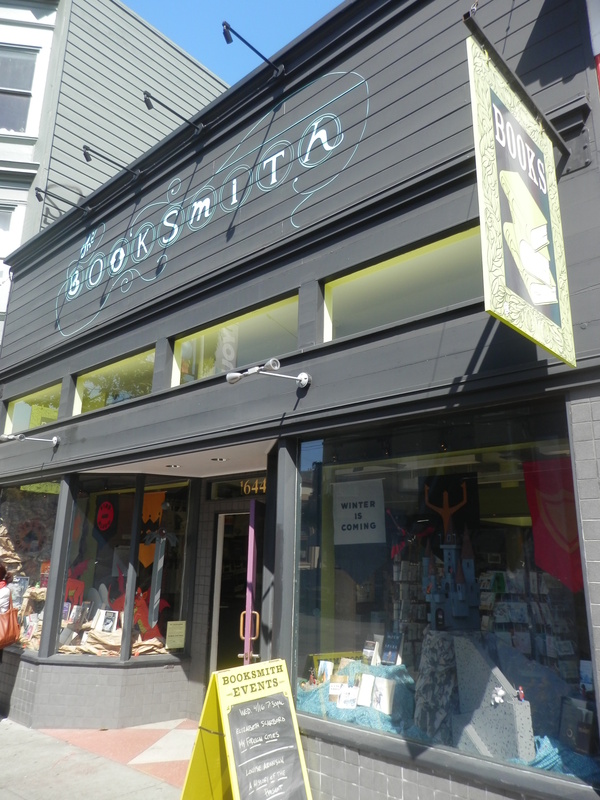 It is reassuring, therefore, to find that Booksmith on Haight Street appears to be flourishing. I continue to make my small contribution to its future. 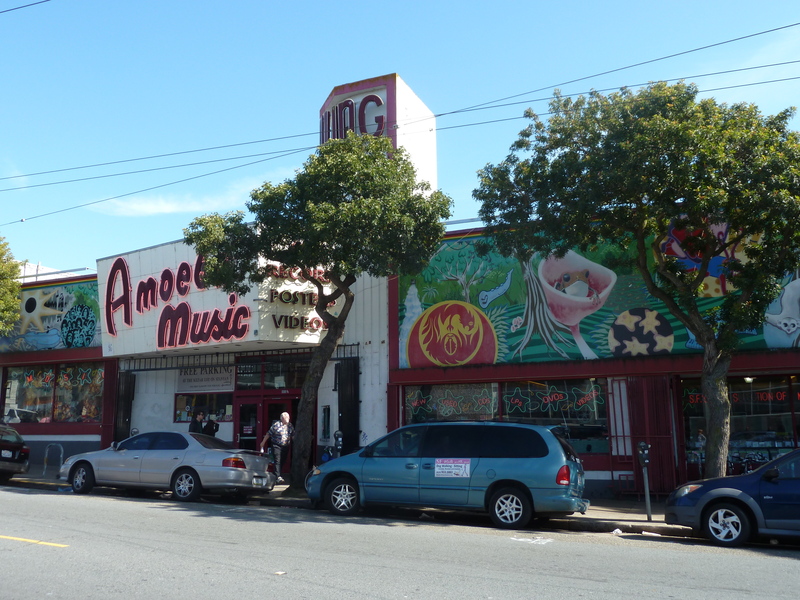 Curiuously, in view of my love for the music that originally flowed out of San Francisco music scene in the late sixties and early seventies, I have never got excited about the prospect of visiting the massive Amoeba Music. It might just be the sheer scale of the place and the fact that it occupies a single floor that disconcerts me. I am, or rather was, accustomed to the stores (Virgin, Tower, HMV) back in the UK that occupied several tiers which made it easier to find what you were looking for. 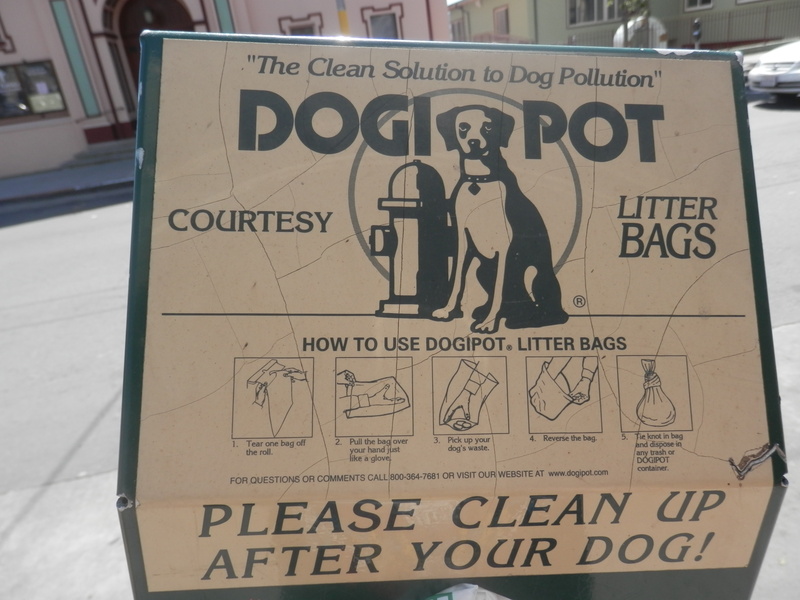 Or it may be the legacy of my first visit when I was told rather aggressively that I had to leave the small bag I was carrying at the entrance. I understand that theft may be an issue, but I form an aversion immediately to any establishment that tells me at the front door that I am not to be trusted. I may be naive but this struck me as especially disappointing on the street where the concepts of love and peace were once so trumpeted. I haven’t been confronted recently but I still find it difficult to cope with the size of, and lack of warmth in, the store. But that’s as much my problem as theirs. As it happens, I am not a great fan either of Rasputin Music which has recently been providing competition for Amoeba on the street. 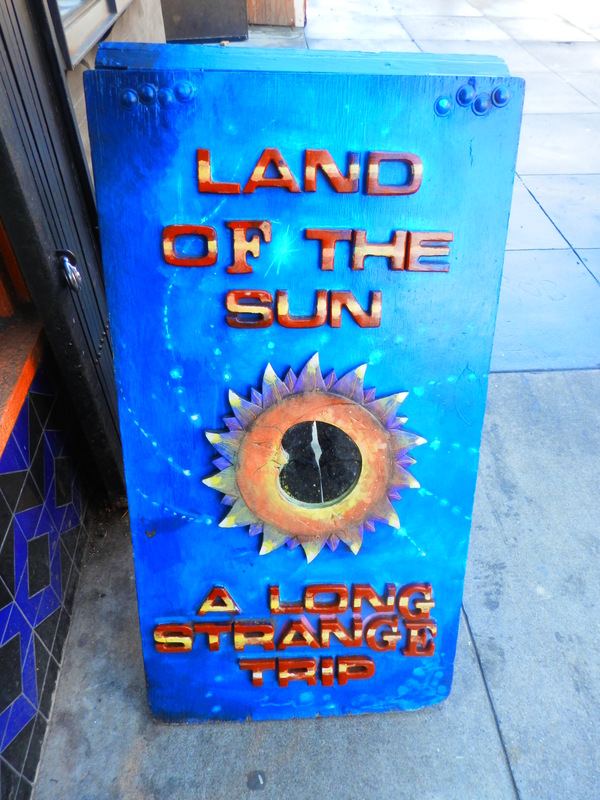 I will finish where I started – with the Land of the Sun store and its reference to the familiar Grateful Dead lyric from Truckin’ of “What a long strange trip it’s been”. There are many other places, events and photographs that I could have included, some of which I have paid tribute to in previous posts, but I am conscious that this post will already have tried your patience. 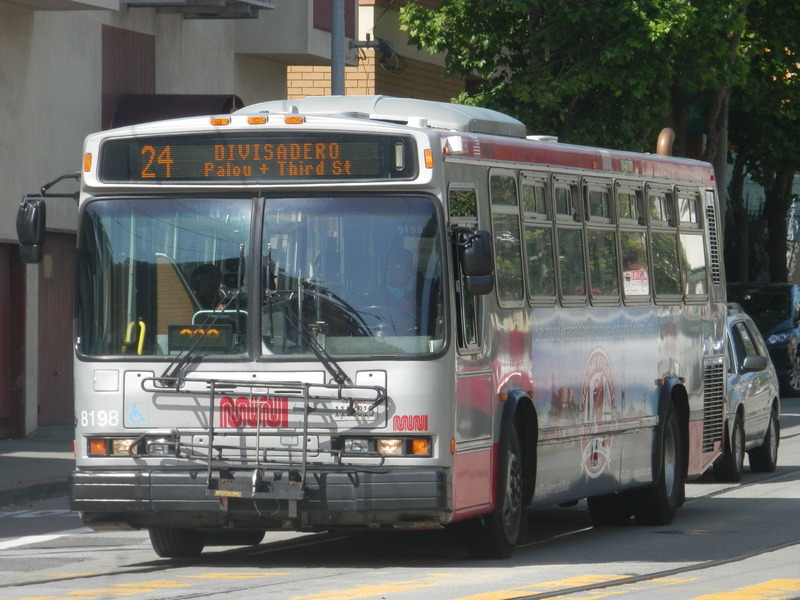 Many will accuse me of having a romanticized, tourist’s – or even dippy hippie’s – view of the modern day Haight, and claim that what echoes there are of the Summer of Love are slight and inauthentic; that, effectively, it is no more than an open air museum (the number of tour buses that still crawl along the street might reinforce that argument). I don’t presume to know whether there is any vestige of truth in that or not. 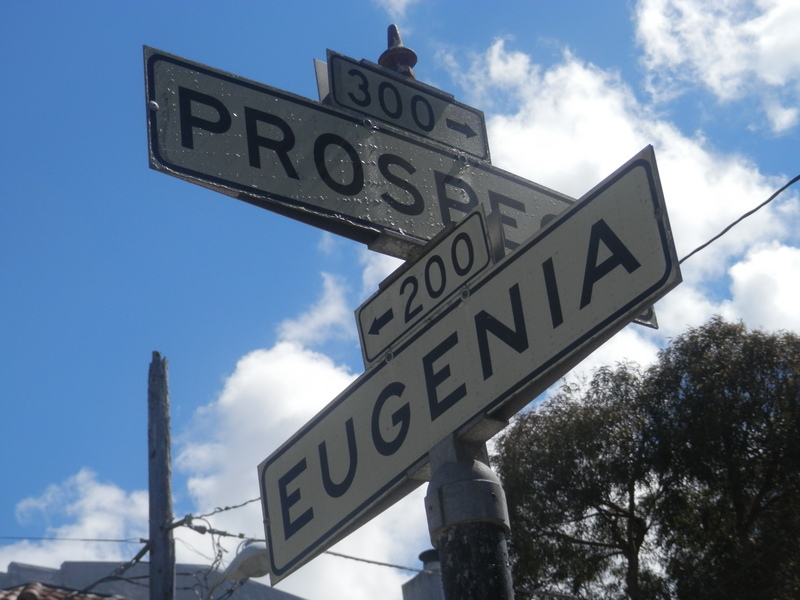 What I do know is that, amid the upscale stores and expensive accommodation (the Haight boasts more single millionaires (283) than any other San Francisco neighborhood), it still means something valuable and relevant for many people – those who lived through the sixties and those who are their grandchildren. 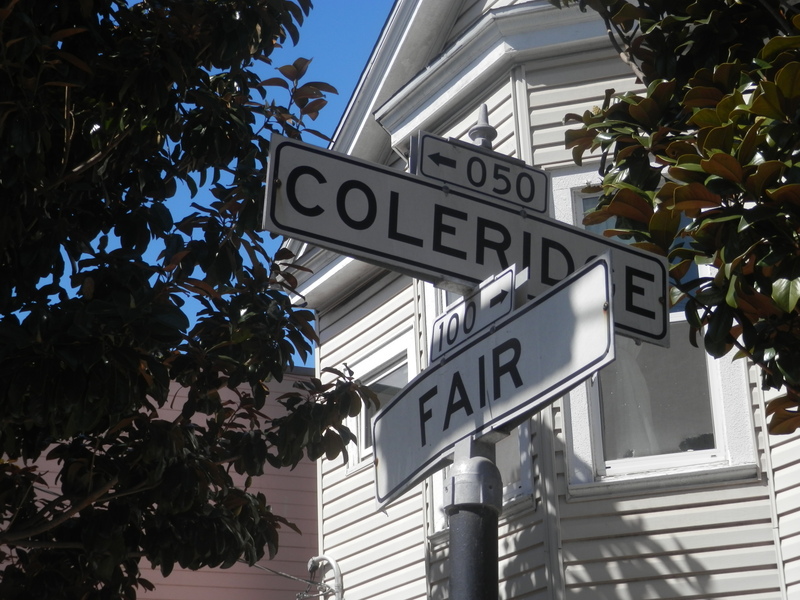 You only need to walk the area during the annual street fair or 4/20 festivities to recognize that. May the trip continue to be long and strange! Not a particularly damning or embarrassing one I would hope – but perhaps I ought to let you be the judge of that. I have a fetish for street name signs. 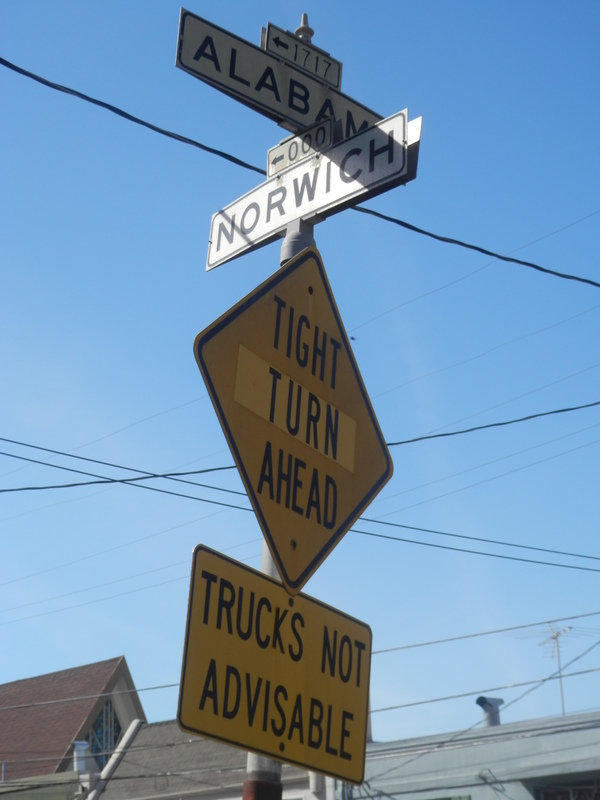 Not the solitary, dull, diffident, street level signs we have in the UK, but those in the United States where they perch high above the road at intersections, invariably two or more pointing in different directions. Those too that sometimes portray a particular feeling – of romance, magic, nostalgia or even incongruity – through the marriage of the actual names. 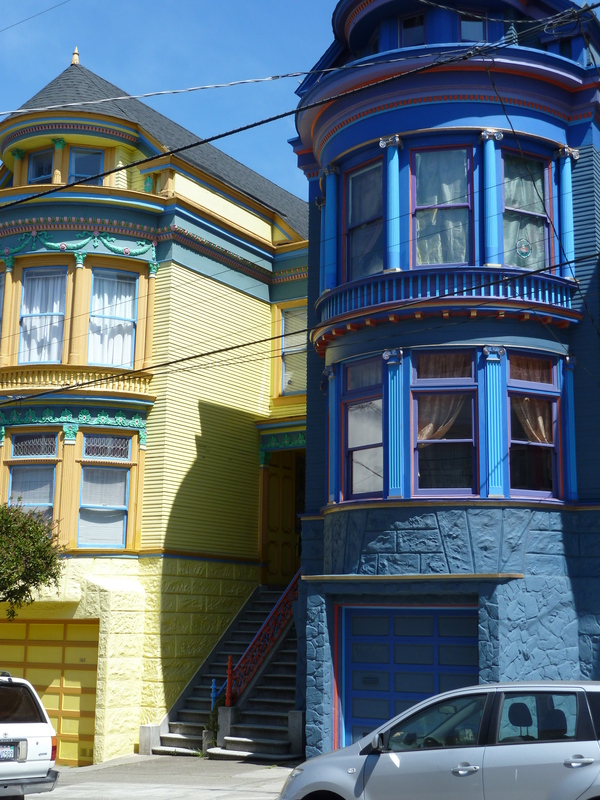 And some – for example, Haight and Ashbury and Twelfth Street and Vine – assume a mythic status in the eyes of millions, evoking a meaningful moment in time and space. Their position in the air often brings into the play other interesting or attractive features such as a pretty house, a bush, other signs, celebrated natural features, and always the ever fascinating dance of the clouds. And if you don’t buy such fanciful gush, then you cannot deny that, at the most basic level, they at least serve a practical purpose in indicating where you find yourself at any one time, and help you to negotiate your way between specific places. 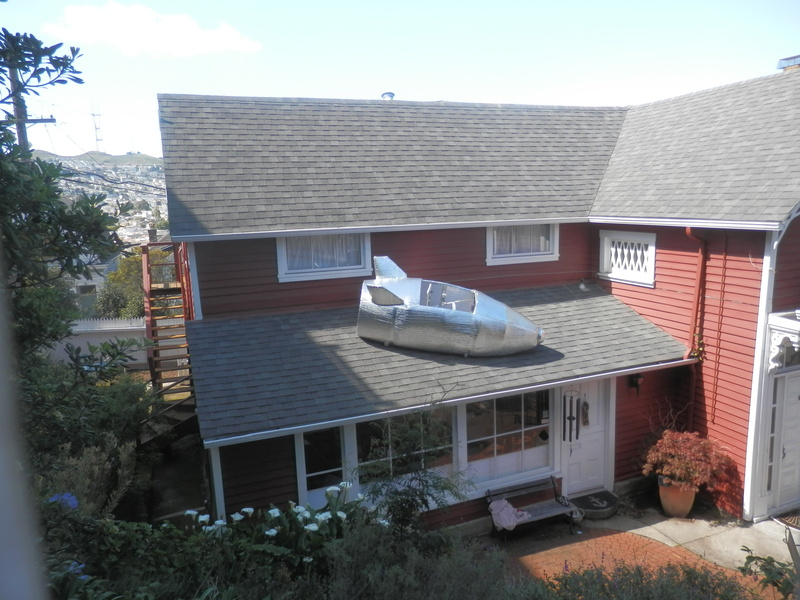 So I have gathered together a handful of some of the most interesting I stumbled across on my rambles round the Bernal Heights neighborhood of San Francisco over the past couple of weeks. If you come across your street or house, I hope you receive it in the respectful spirit in which it is offered. Hey, Are You the British Guy? It started within minutes of leaving the cottage on our first morning back in the city. 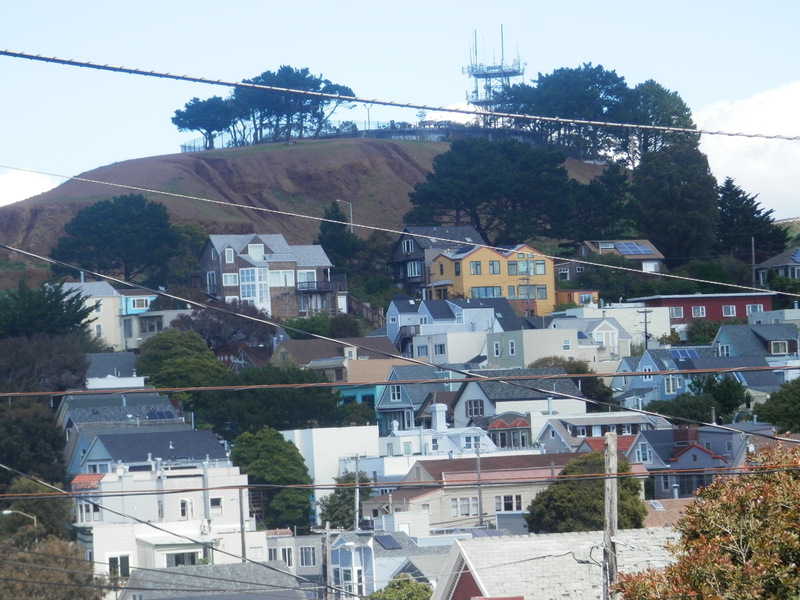 As we crossed Cortland Avenue in Bernal Heights to indulge in a Progressive Grounds brunch, an elderly woman walking her dog launched a cheery “hello British people” in our direction. No sooner had we digested this unexpected salutation than she had moved on her way, satisfied, I hope, that she had made us feel immediately at home in the neighborhood. And, less than a week later, that feeling has only grown progressively stronger. 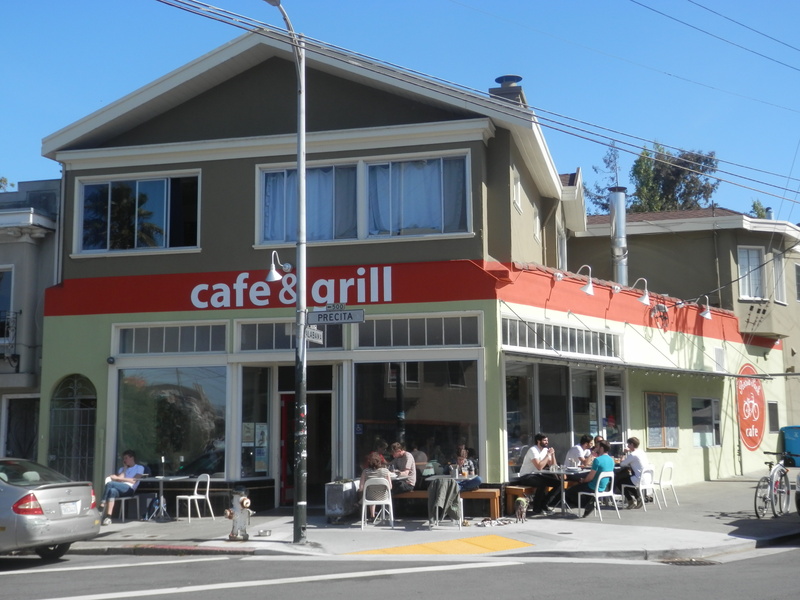 I suspect that it has been partly fuelled by a request from the moderator of the Bernalwood website and associated Facebook page to make us feel welcome if we were spotted out and about. If so, it has certainly worked! But the reaction has still been remarkable. I feel like a minor celebrity every time I step out of the cottage. But I think it has more do with the fact that the people in this neighborhood are just so nice and welcoming. But by this time she had moved away, though not without a friendly wave. Perhaps she had recognized me from photographs. Or rather assumed that the clichéd touristy garb and eccentric behavior had me clearly marked down as a crazy limey. Either way, I was grateful (no pun intended). 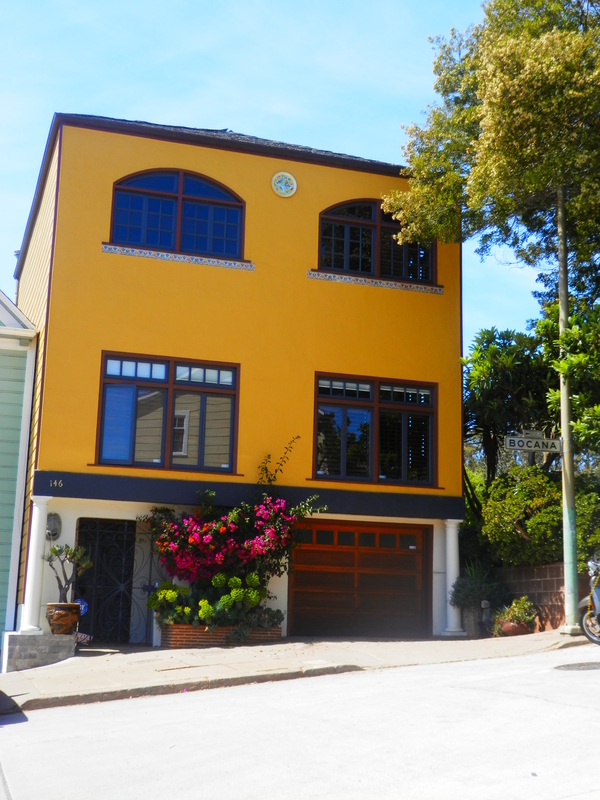 Much as I have enjoyed staying in other neighborhoods in recent years, I can comfortably assert that Bernal Heights has captured my heart like no other. 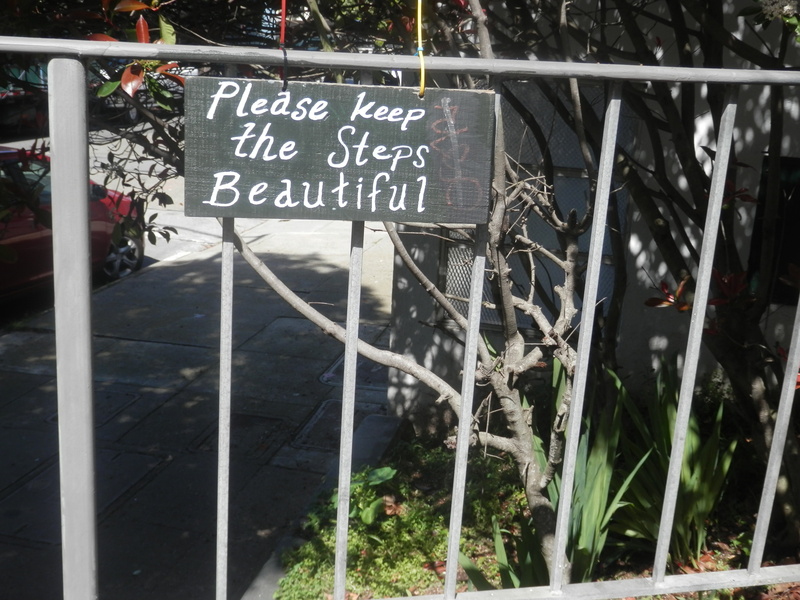 Pretty, civilised, quirky and friendly (everyone on the street, in the cafes, restaurants and stores says hello – even the dogs), only birdsong and the gentle hum of the occasional automobile or 24 or 67 Muni bus (and next door’s dog on the past two mornings) ever disturb the calm. I have two other examples of how willing and accommodating the residents have been to me. I visited the local branch of the San Francisco Public Library in pursuit of printing my latest blog article on our second morning. I was impressed by the free fifteen minute internet computers but utterly bewildered by the complex process for printing the pages out. 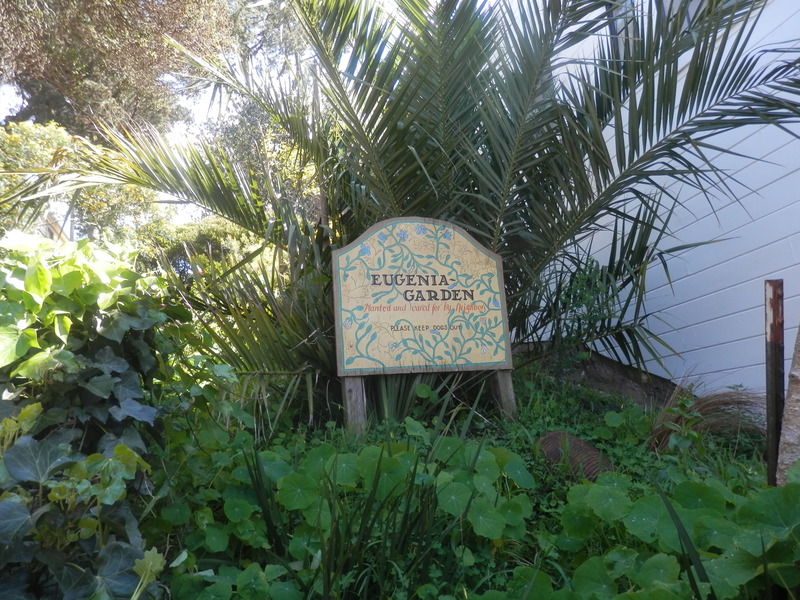 A lady librarian patiently talked me through – twice, or it may have been even three times – the registration and payment procedure until I was able to achieve my aim. In the course of this, we got into conversation about my arrangement with Bernalwood, which she was fascinated by. 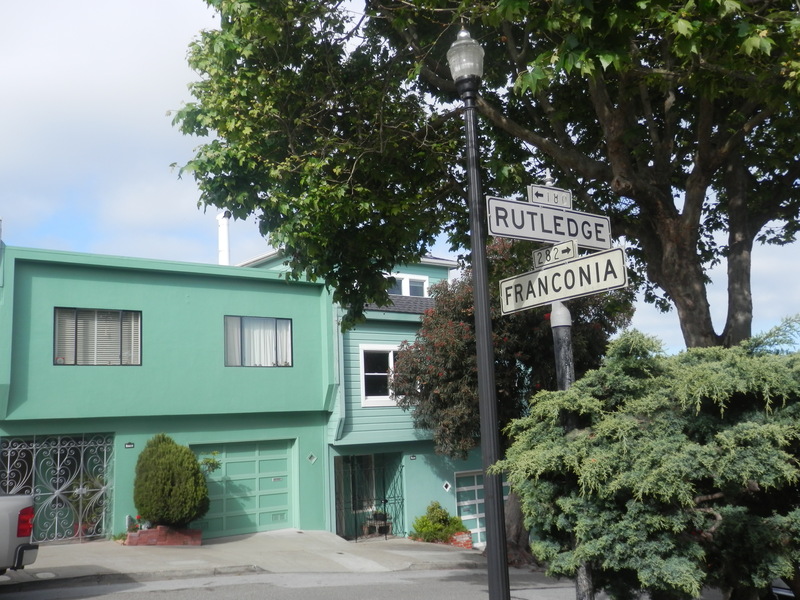 We talked briefly too about the fact that, perhaps unlike other San Francisco neighborhoods, Bernal Heights had a genuine sense of community and a real village atmosphere. I was already beginning to appreciate that. Shortly after this I called into the Heartfelt gift shop and enquired, understandably sheepishly, whether they stocked a pencil sharpener. The girl who served me could not have been more helpful, and eventually, after several false trails – mainly in the children’s section – and mutual chuckling, I parted with $3.81 for a pencil that not only had a sharpener appended to one end but had the added if unnecessary bonus of an eraser at the other. The next morning, after a splendid brunch at the Liberty Cafe, my wife and I called in again. The same girl recognized me and was immediately chatty about what our plans for the day were, joking that she never made it down to San Jose because she could never get up early enough! 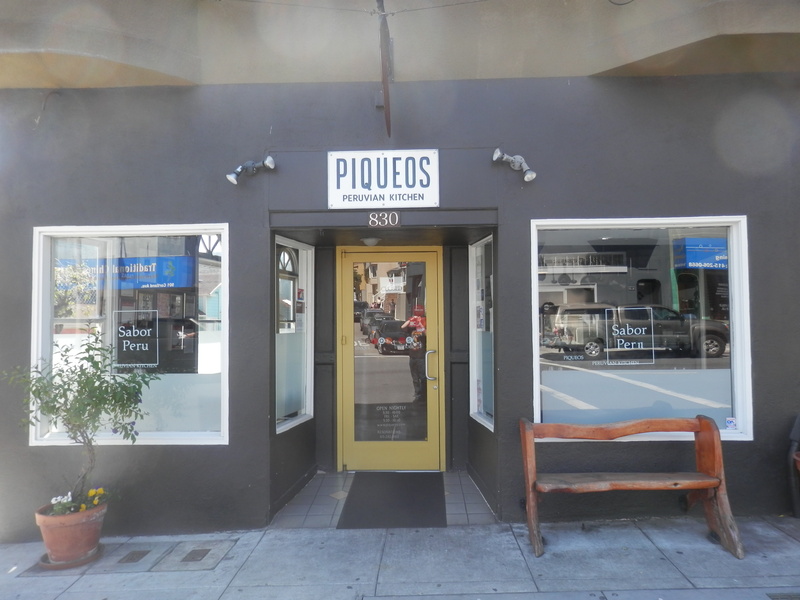 Friendly attentive service was also the order of the evening when we had dinner in Piqueo’s, a superb Peruvian restaurant on Cortland. It was so comforting too not to feel pressurized to eat up and leave as soon as possible, as can often be in the case in American restaurants. 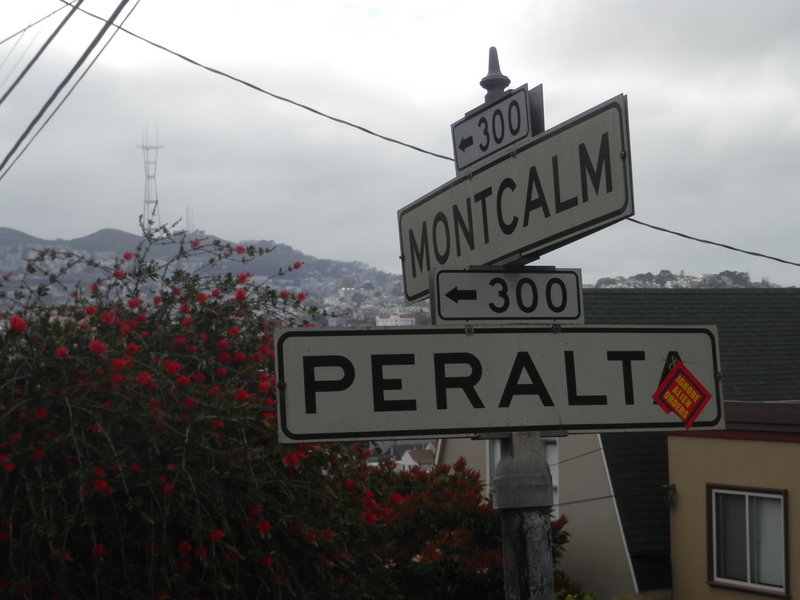 Thank you people of Bernal! I hope our second week produces further examples of your hospitality and generosity. Our first morning in Bernal Heights was spent in getting the washing done from the week in Tahoe (one of the most welcome features of having your own place in the city), catching up on the morning commute and weather forecast on KRON4, trying to avoid re-living the Giants’ frustrating defeat in Phoenix the night before and re-acquainting ourselves with proper granola and sourdough toast. We finally slipped out into the warming sunshine (was the rain really so torrential when we arrived last night?) a few minutes before one o’clock, heading for our favourite lunch spot (well, actually our only one up until now) of Progressive Grounds on Cortland. 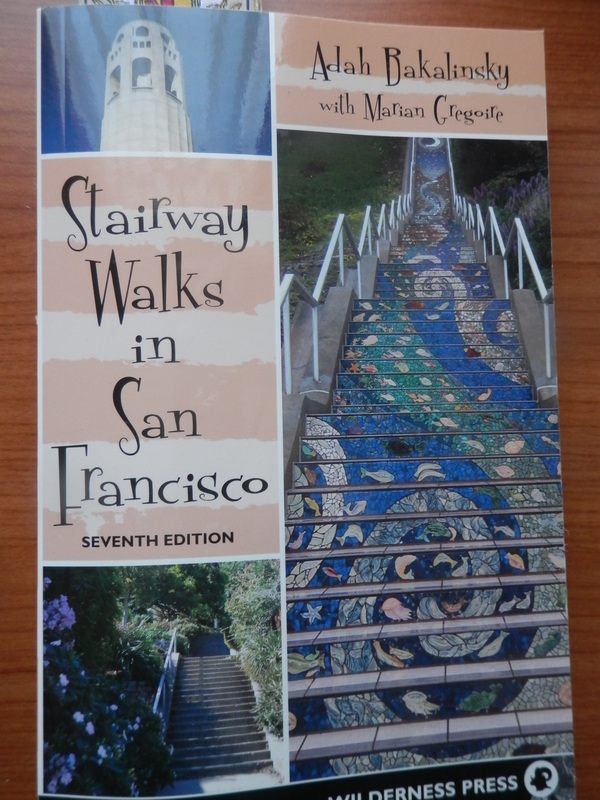 Lugging – perhaps unwisely – bagels filled with cheese, egg and peanut butter in our stomachs, we set off on one of the neighborhood stairway walks described by Adah Bakalinsky in her extraordinary book entitled, strangely enough, Stairway Walks in San Francisco. 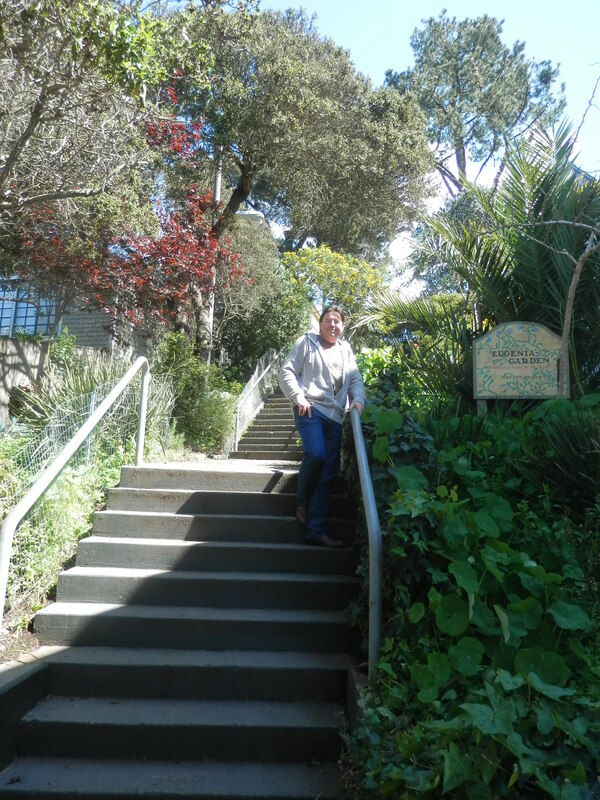 Bernal Heights has the greatest number of stairways, around fifty four, in a city boasting several hundred. Normally, we would wander aimlessly around the area, stumbling, or not, upon some natural or architectural gems purely by chance. But today I wanted to ensure that we didn’t miss any of the sights (though locals will surely disabuse me of such presumption when they read this ). 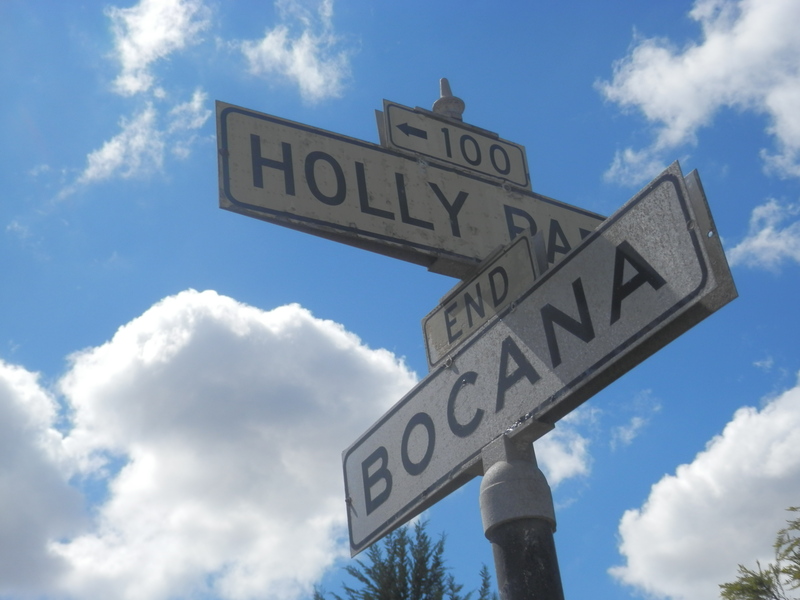 Our walk began at Holly Park Circle at the intersection with Bocana Street. The view looking back towards the hill provided perspective and familiarity. 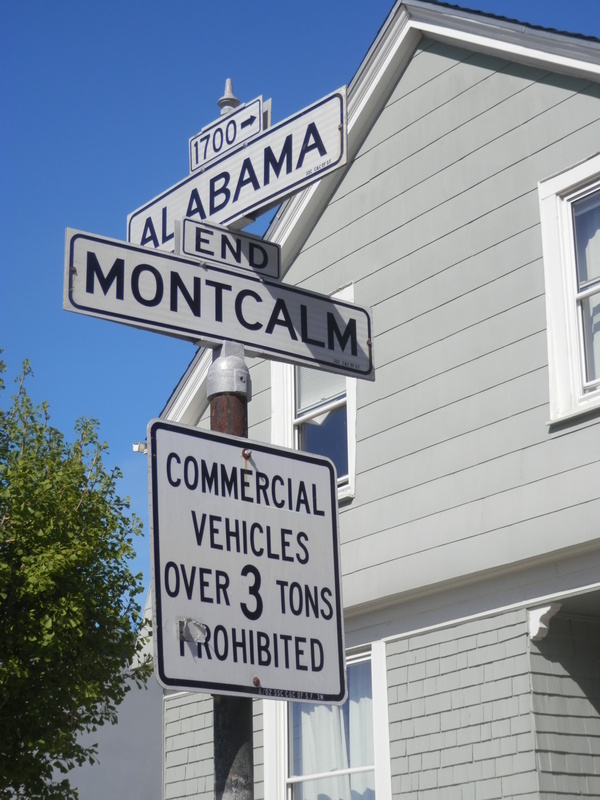 One of the most satisfying features of a visually stunning city are the signs at the intersection of streets. 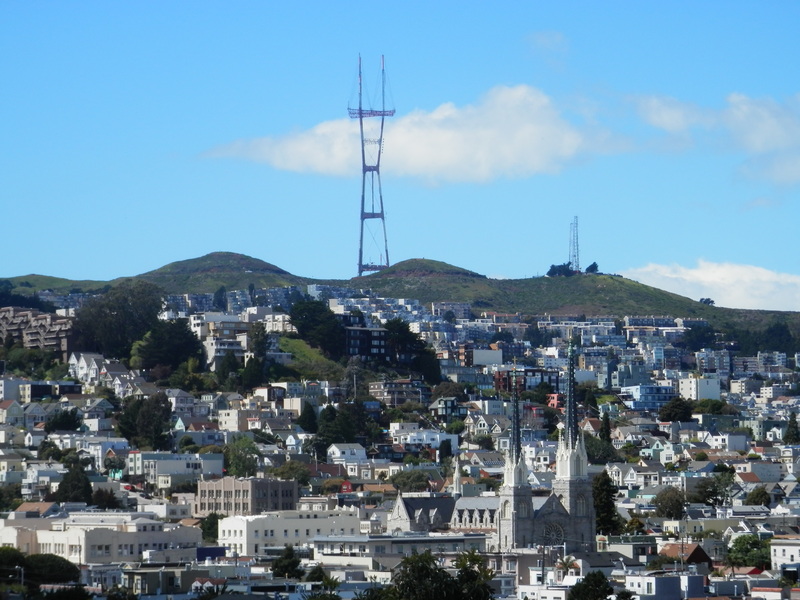 For me, they are as iconic as the Golden Gate Bridge, Alcatraz or cable cars. 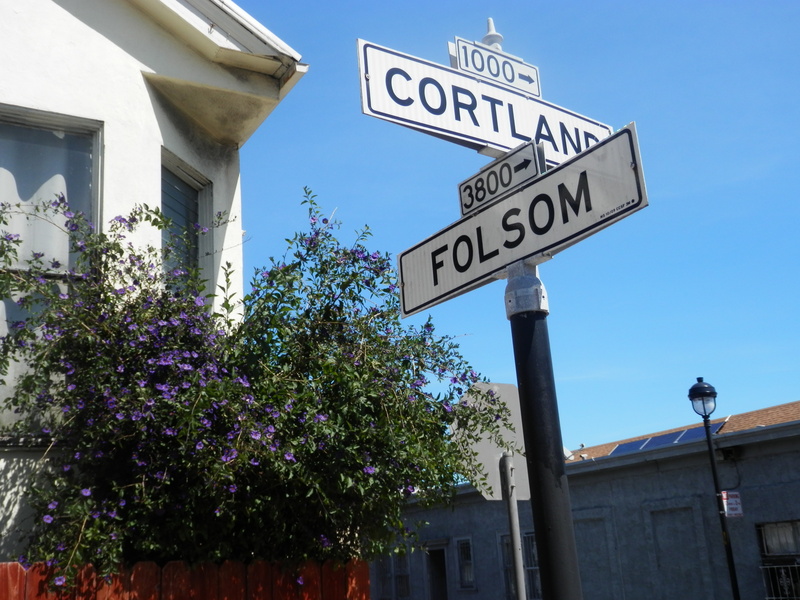 Whilst Haight/Ashbury and Powell/Market may be among the most celebrated, it is those that you discover in half-forgotten corners of downtown or out in the neighborhoods that provide the real thrill, not least when the juxtaposition of names appears particularly incongruous. 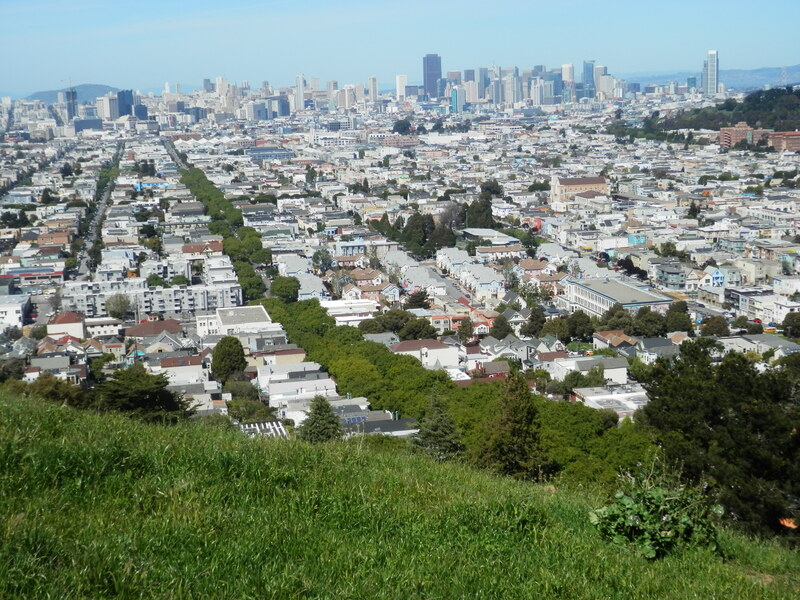 We circled Holly Park, stopping intermittently to scan the horizon – from downtown to Bayview, Hunters Point, Candlestick Park and McLaren Park. 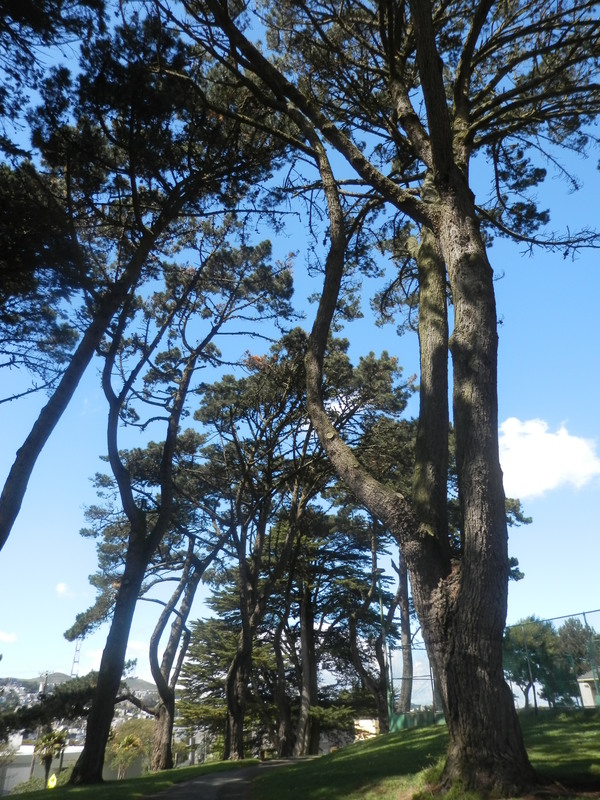 The marriage of sky and trees enabled some lovely photographic opportunities. 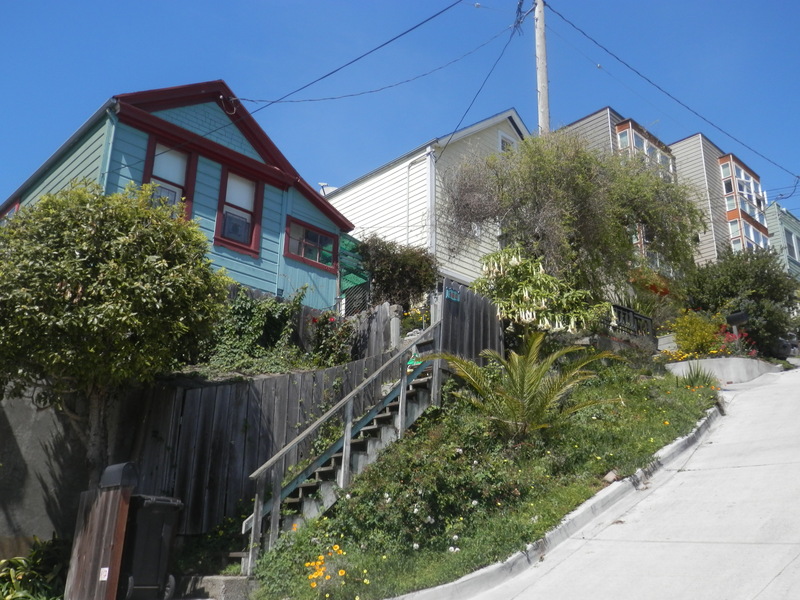 The decision to follow a recommended walk was vindicated because we might otherwise have missed a number of delightful and ingenious gardens and stairway as we criss-crossed the streets of the western side of Bernal Heights. 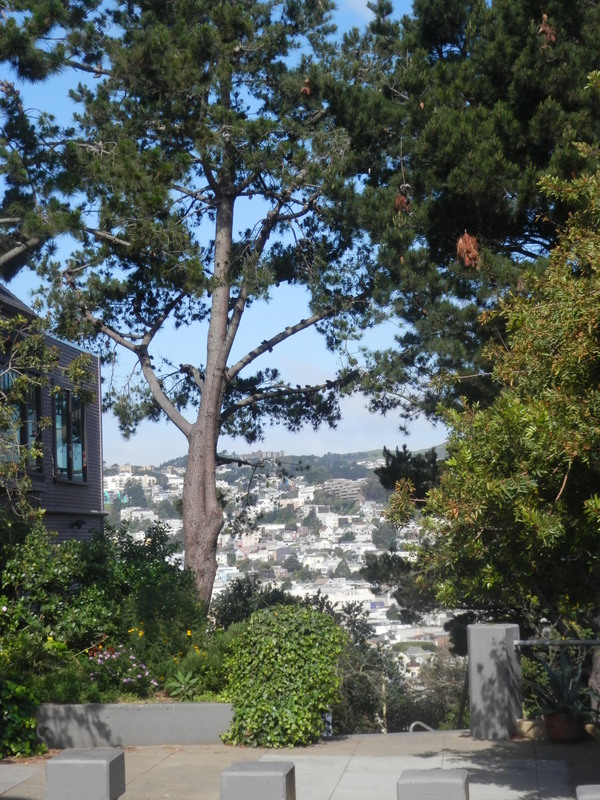 Stunning views of Twin Peaks, Diamond Heights, Noe Valley lay before us or peeked through overhanging trees at every point. 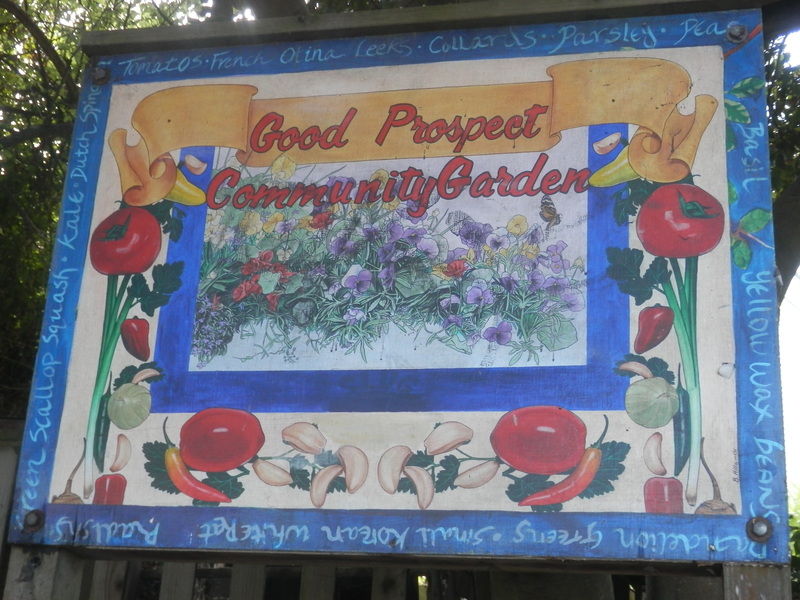 The love lavished on these community gems was evident in the signage that accompanied them. How could you argue with such requests? 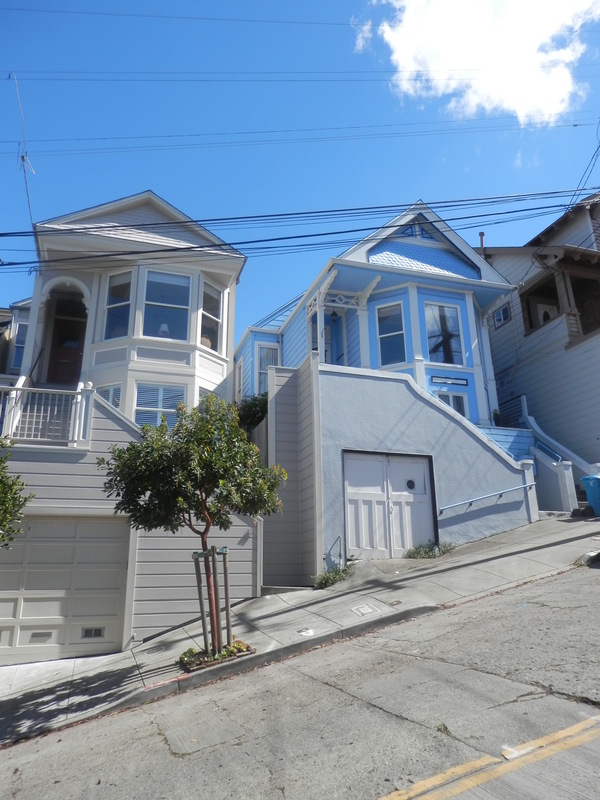 This being San Francisco, the stroll was never on the flat for very long. Fortunately, there were rest areas laid out to enable the perspiring hiker to take a breather, notably on the long, steep Esmeralda Stairway that we dipped in and out of towards the end of the walk. Such a shame there isn’t a Wordsworth Street, especially in such a literary and artistic neighborhood. Why couldn’t this have been a downhill stretch at the beginning of the walk rather than the latter? Finally, proof that aliens are among us. 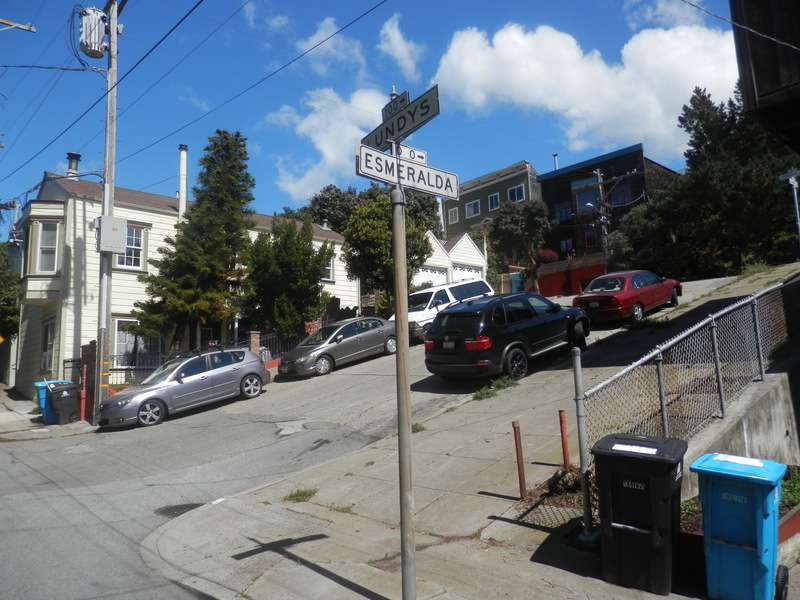 At the top of Esmeralda we joined Bernal Heights Hill where, as had been the case when we visited last year, dogs greatly outnumbered humans. We sought out the mud and pebble path of the short Moultrie Stairway and, via Powhattan and Bocana, returned to Cortland where frappés beckoned at Martha and Brothers. The walk had been every bit as thrilling – and challenging – as we had anticipated, undertaken in increasingly warm conditions. A great first afternoon in the neighborhood! 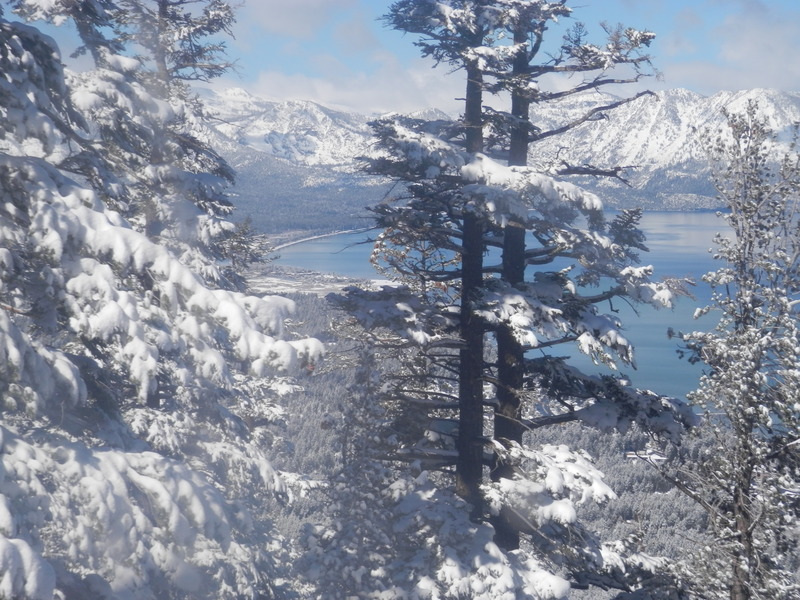 We had not skied Heavenly since 2011, although we had visited in both of the intervening years. In 2012, a planned three day break slotted between visits to San Francisco coincided with both of us contracting flu and being physically too weak to ski. And last June, logs, pipes and assorted wooden debris were all that lay on the mountain. And for much of this winter the signs were ominous. 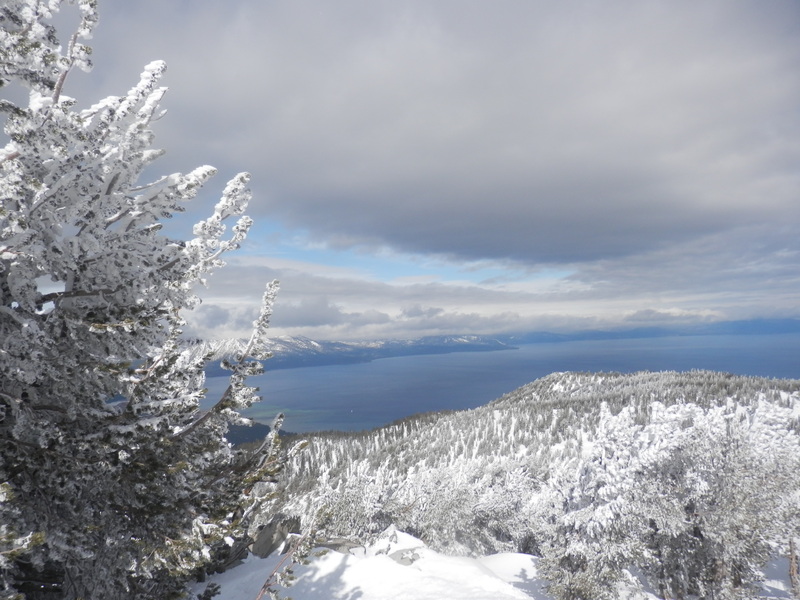 The guaranteed snow levels normally associated with Tahoe, and Heavenly in particular, had failed to materialise. 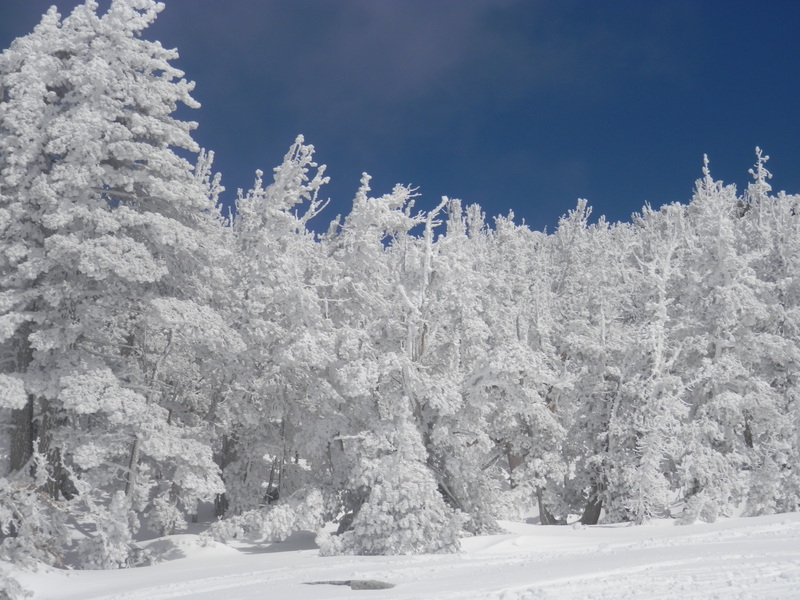 Every day since Christmas, we scoured the webcams and weather forecasts, only to discover that many of the lifts and trails remained closed and the famed snow making operation was being pressed into overdrive. We have always skied late in the season in the expectation that a) the snow would be plentiful and b) spring sunshine would dominate. 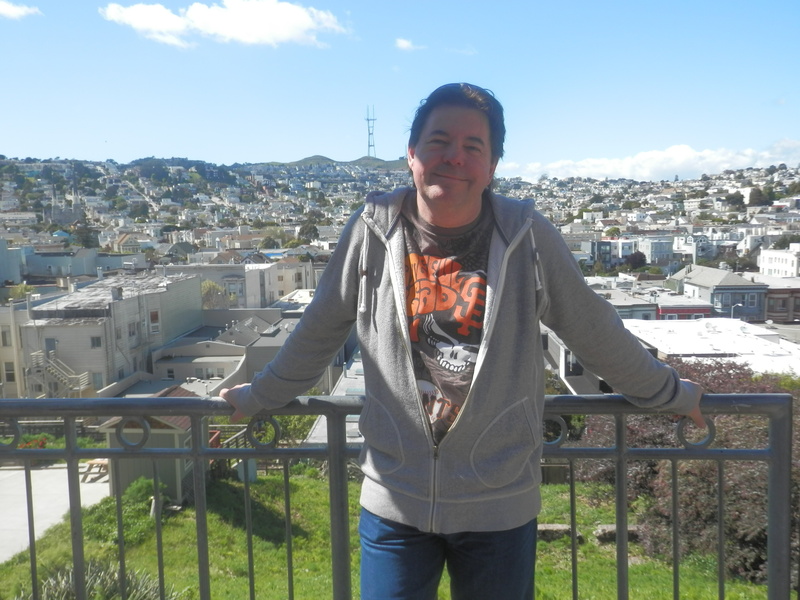 So when we heard when we arrived in San Francisco at the beginning of the week that the long awaited snowfall would be pulling into town at the same time as us, and staying for the duration, we had mixed feelings. But we have been incredibly lucky. We had purchased a four day lift pass, taking the Saturday off when the worst (or best depending upon your point of view) of the storms was projected to arrive. 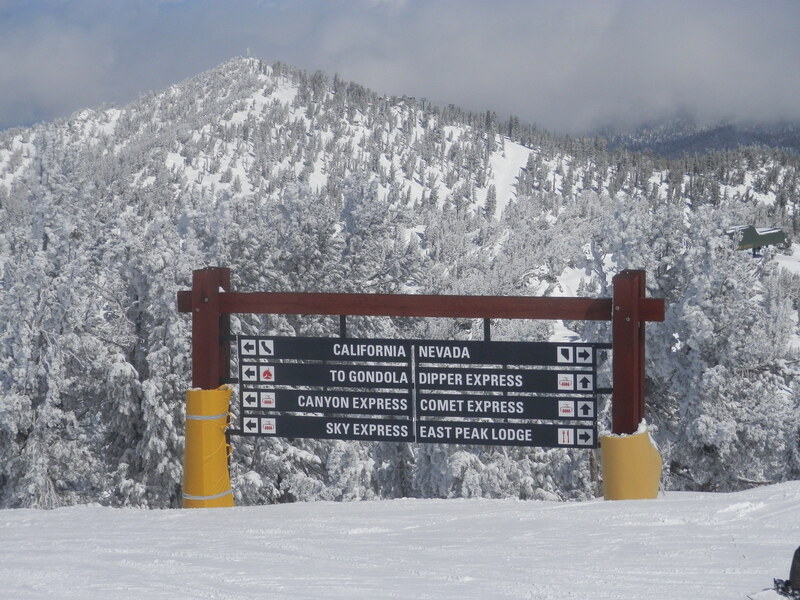 Although, with the exception of our final day, sun was in short supply, the wind that often affects resort operations, closing the higher lifts and restricting the capacity of skiers and riders to travel between the Nevada and California sides, was equally ineffective. The intermittent gloom and smattering of snow flurries of the first couple of days enabled just to take some satisfyingly moody photographs. We were able to ski virtually the entire mountain over the four days. 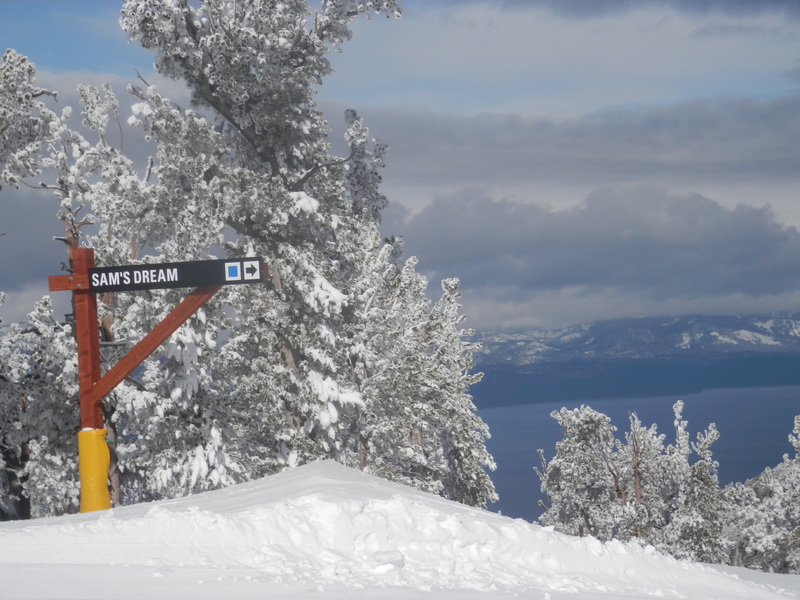 Only on the first day were we prevented from cruising both states, being confined to the California side due to the closure of the Tamarack chair. This was welcome, however, as we tend to spend more time on the longer trails in Nevada. With the Sky Express chair leading to the highest point in the resort open, we were allowed to spend time on our favourite trail, Ridge, which arguably provides the best views of the lake, and the High Five trail that we had not skied before. 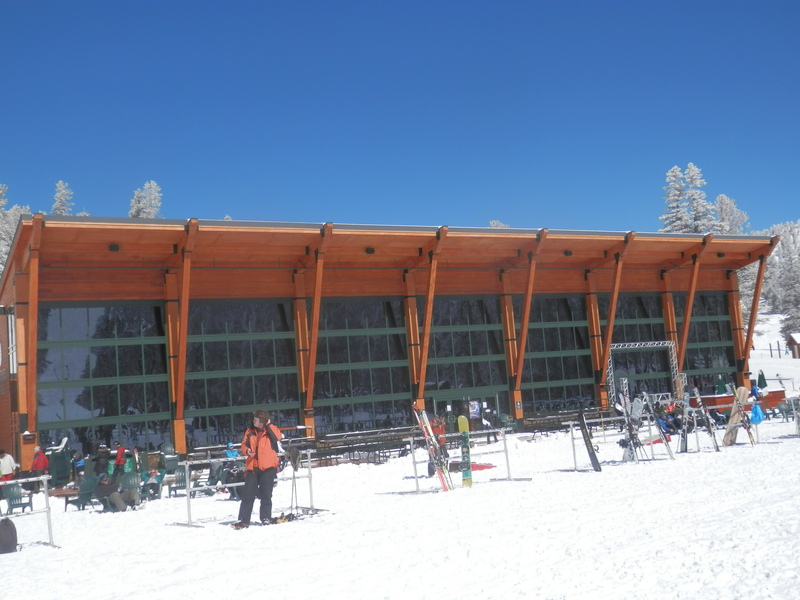 We also managed morning hot chocolate stops and lunch breaks at all the major mountain lodges – California, Tamarack (pictured), East Peak, Sky Deck and Stagecoach – that were open. Not having the presence of mind to reach for the camera as Janet struggled to get to her feet, having fallen on the Galaxy trail only minutes after she had joyfully proclaimed ONE NIL when I had suffered a similar indignity. We may not have seen the last of the snow as we look set to grapple with the next big storm on our return to San Francisco tomorrow.